Public procurement is the process whereby public authorities purchase equipment and services from the commercial sector. Pre-commercial procurement is a special form of public procurement which is adapted to research and innovation: public authorities in a step-by-step process select organisations which offer to carry out research and innovation activities. After a first early prototyping stage, a reduced group of finalists is retained to deliver the final prototypes. Based on the outcome, then a commercial procurement phase starts. The SHUTTLE project started in May 2018. During the first months of the project, the consortium members will define the requirements for the SHUTTLE toolbox. Starting from November 2018, the consortium will organise an open market consultation to connect with relevant companies to probe industry interest and be informed on the state-of-the-art. These will be published in a tender around June 2019. 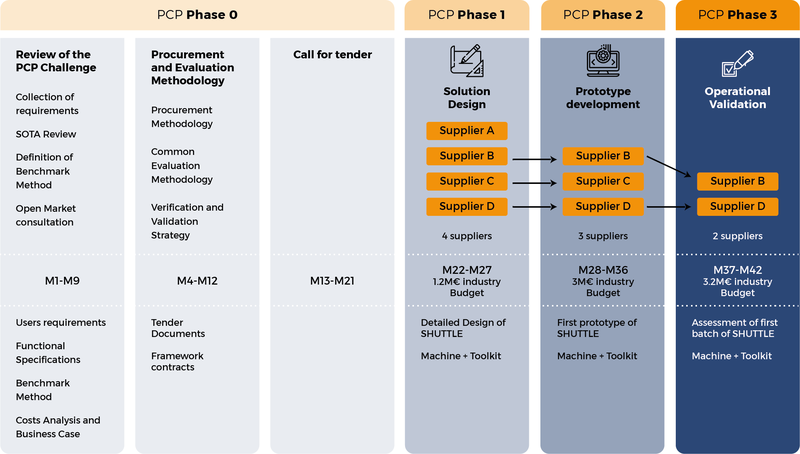 Received tenders will be reviewed by the consortium and a number of companies will be awarded a contract (January 2020) to produce a concept design, consisting of detailed design specifications of hardware and software. The providers of the most promising concept designs will be invited (November 2020) to build a prototype and through an operational validation possibly a larger range of products. Please note that the mentioned dates are according to current planning and might be adjusted due to circumstances.